Whoa. Over 500 of you read Monday's post about my results with Keto. For someone who has kind of fallen off of the blogging bandwagon, that's a lot of people! I love that the post struck a chord with you, and that you had questions you wanted answered! I wanted to go over a few of those questions today - again based on the premise of what's worked for me. If you want even more in depth answers, you know what to do: order Simply Keto (it's available on Prime and can be at your door in 2 days)! Q: Can I have cheat days on Keto? / Is it a lifestyle? A: Nope. You really, truly cannot cheat. It will knock your body out of Ketosis (read more about that in Simply Keto). For example, we took Easter off and definitely noticed a change in our bodies/results. And that was just ONE day with a few pieces of candy and some potato salad! Honestly, a few sugary foods weren't worth all of the hard work I had put in over the previous four weeks. Bottom line: don't cheat. You won't get the results you want. In fact, you probably won't get any results. While I hate the word "lifestyle," I think it's more along those lines than a traditional/typical diet. 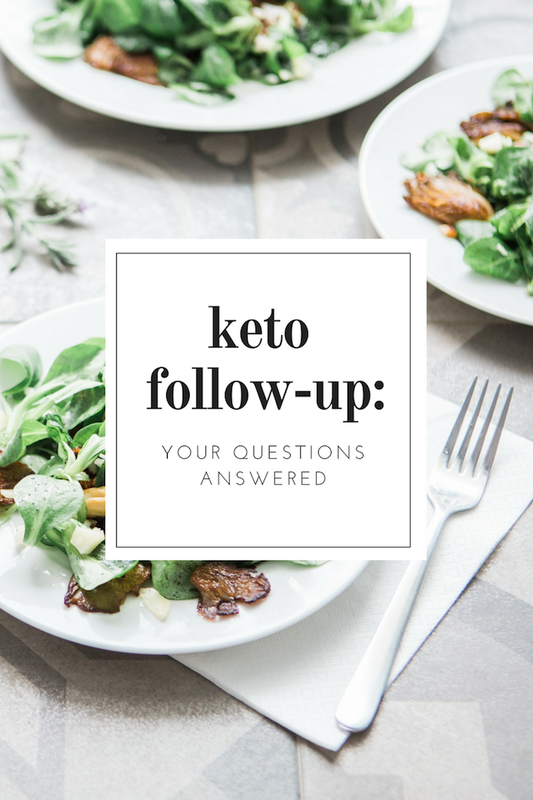 Q: How is Keto different from Whole 30? A: Keto is very different from Whole 30. I am a BIG supporter of doing what works for you. Whole 30 is an elimination diet that focuses on helping you identify the foods that do not work for your body. It's a total reset for your insides! It's also not for me, and that's okay. Keto might seem counterintuitive after years and years of being told fat is bad. And for transparency's sake, I'm not convinced putting ranch on anything that sits still is totally healthy (lol). But if that means I choose a salad and get excited about it AND lose a little weight, I'm all about it. Before you dive in, do your research and discover what might work for you. You might prefer dabbling with Whole 30! Q: Can you eat fruit on Keto? A: Yes! You definitely can, but you have to be smart about it. Fruits (like bananas) tend to be carb heavy. Choose raspberries, blackberries, and strawberries for lower carb choices, but watch your portions. Again, read about this in Simply Keto. I also look at it like this: if the choice is a cookie or a banana, having a banana is the better choice. My ultimate goal is to be happy with my weight and body, so I can get back to noshing those healthy foods, no matter what they are, regularly. Q: Do you only eat chicken salad for lunch? A: No, not necessarily. However, I do LOVE chicken salad, so I tend to gravitate towards it. It's also almost always available on menus for when I go out to lunch. Finally, it also is an easy way to hit protein and fat goals for macros. Other great options for lunch that I've found that I love are poke bowls (skip the base all together & double up on the veggies down the line - and the mayo-based dressing), Jimmy John's unwiches, pimento cheese, and burrito bowls (no rice, no beans, but all the cheese). At home, I'll make a quick Cesar salad or deli roll-ups (with Simply Keto honey mustard!). Q: How did you kick the coke habit? A: This one was hard for me, but not as bad as I was expecting. I tried the sparkling water thing (gross), so what has worked for me is sticking with water with lemon during the week or water with some form of low-carb flavoring (I like fruit punch Mio). And at the end of the day, I look at it like this: if I have extra carbs, I can spend them on wine, and I'd MUCH rather have wine than a coke! Q: What are your must-have pantry staples for Keto? Q: What are your favorite Simply Keto recipes? Let me know if you have any other questions! I am happy to keep answering them for you!